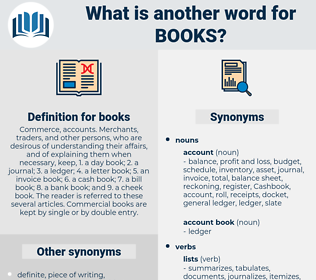 What is another word for books? Commerce, accounts. 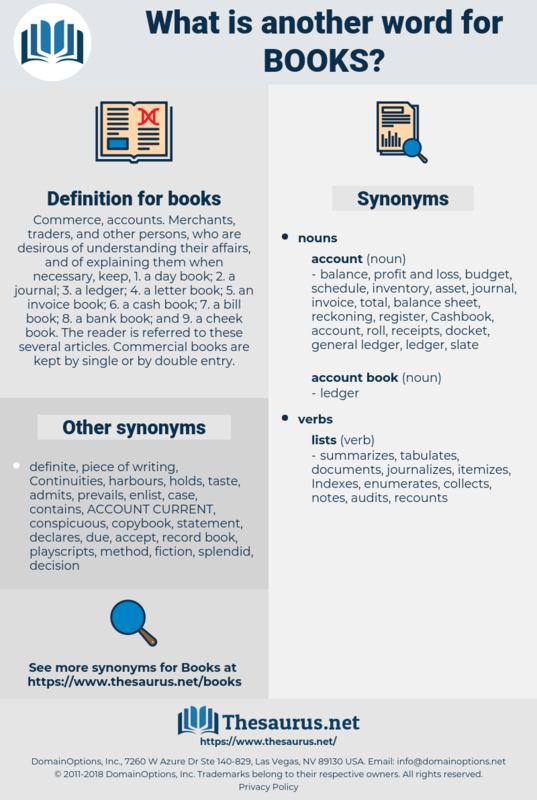 Merchants, traders, and other persons, who are desirous of understanding their affairs, and of explaining them when necessary, keep, 1. a day book; 2. a journal; 3. a ledger; 4. a letter book; 5. an invoice book; 6. a cash book; 7. a bill book; 8. a bank book; and 9. a cheek book. The reader is referred to these several articles. Commercial books are kept by single or by double entry. workbook, workbooks, journal, textbook, Textbooks, yearbook, booklet. Cookbooks, bookstores, Guidebooks, notebooks, Booklets, storybooks, schoolbooks, copybooks, yearbooks, logbooks, handbook, handbooks, booksellers, bookshops, casebooks, scrapbooks, novels, bestsellers, Journals, albums, Brochures, Pamphlets, volumes, catalogues, guides, Directories, leaflets, Scriptures, texts, manuals, Tales, Diaries, workbooks, Textbooks. Compendiums, reports, Resources, Scriptures, kits, games, PRTRS, products, accounts, articles, references. articles, references, Undertakings, cahiers, engineering, by, keeping, pollutant, visitor, visitors, existing, olympic, additional, cover, river, visits, GST, CRA. instructions, published, writings, jobs, Periodicals, publicaciones, Stories, authorities, written, Magazines, comptables, bibliography, documents, legislations, contributions, publishers, newspapers, Saddlebags, narratives, Films, proceedings, Histories, submissions, reports, presentations, labels, inscriptions, archives, bonds, ouvrages, registrations, dossiers, procedures, procurements, Guidelines, versions, projects, qualifications, installations, artworks, recordings, classics, credentials, terms, certificates, enrolments, statements, Resources, Syllabuses, exhibits, Selections, constructions, paintings, roadmaps, perpetrators, fascicles, materials, recipients, creations, savings, passports, portfolios, supplements, Contes, comptes, repertoires, productions, mouthpieces, comics, sections, Languages, headings, pieces, check-ups, captions, banks, Inventories, assessments, bills, readers, rates, monographs, invoices, Indexes, finances, $, reserves, contracts, workings, oeuvres, livrets, orders, Budgets, offenders, Copies, pockets, crossings, repositories, buildings, applications, discussions, debts, rooms, headlines, programme, numbers, laws, LBS, elements, force, cards, editors, VOLS, estimates, serials, statutes, holding, holdings, Pleadings, table, tables, binders, checks, exemplars, packages, briefs, findings, textes, Studies, ledgers, Galleries, deposits, Romans, kits, Risks, designs, portions, accountants, sites, Quantities, systems, parts, components, reviews, listings, sheets, signatures, consumers, searches, doings, awards, tariffs, reserve, wallets, Surveys, updates, registrars, protocols, digests, codes, sources, numerals, acts, Schedules, rosters, PRTRS, balances, rails, subjects, features, liras, issuances, schemes, things, stores, profiles, Securities, outputs, Diplomas, Deliveries, outcomes, levels, NATIONALS, markings, read, lists, shadows, Filings, Coins, sales, offices, held, Capacities, proposals, Canadians, deeds, scores, degree, degrees, auditors, assets, account, accounts, Prices, Fees, Permits, electors, clerks, Addresses, grades, expenses, abstracts, sponsors, Facilities, digits, Activities, Entries, ministries, choices, Incomes, files, tenders, seats, agenda, agendas, rolls, Factories, dampers, pools, place, loans, trace, traces, tools, FARES, titres, crafts, samples, cases, rounds, audits, items, Plants, ranks, kinds, Ones, Tests, Forms, results, amounts, Parties, licences, french, Plays, counts, types, shares, figures, sides, states, articles, units, references, date, Undertakings, goods, cahiers, visitors, visits. Literatures, Compendiums, authors, chapters, reservations, contents, compilations, Libraries, Cartoons. When he had finished she cleared the table and then read to him a story from one of the books. There were a few books along.